Locations International Sign in Sarasota,St.Petersburg,Ft. Meyers and surrounding areas. International Sign services the west central Florida area. We have service and installation depots in strategic areas around the west central Florida area to give International Sign faster response and turnaround times all across the west central Florida area. 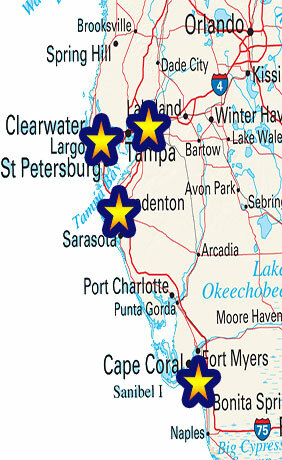 Our repair and installation teams are right in the area giving you faster repairs and installations. Our area sales offices also provide outbound sales support for your business. What this means is We'll Come To You to help with all your signage needs. Give International Sign a call today, let us show you how we can help your business needs.